A coalition of Great Lakes advocacy groups launched a this campaign to help demonstrate that wolves are a public asset, beloved by the citizens who live here. The majority of citizens, including those living amongst wolves, representing all walks of life including hunters, hikers, naturalists and farmers of Wisconsin, Minnesota and Michigan believe that wolves belong on the landscape and understand the vital role wolves play in the ecosystem. The project was launched with help from Mindfruit Studios and world renowned photographer, Jim Brandenburg, who lends his voice to this beautiful campaign launch video. We sent the following video to Senator Tammy Baldwin in response to her stance to remove wolves from the Endangered Species Act. Please take a moment to view this important video response. Please join Friends of the Wisconsin Wolf and watch our debut film, Political Predator. The film’s subject is how the Wisconsin Wolf Hunt came to be up until relisting in December of 2014. The wolf is currently in jeopardy again with two congressional bills. The film goes into great depth regarding the politicization of the species, including the attack on the Wisconsin Idea, the UW system and science. In this companion film to Political Predator, we take a closer look at the practice of using hounds to hunt wolves. When wolves were reintroduced to Yellowstone National Park in the United States after being absent nearly 70 years, the most remarkable “trophic cascade” occurred. What is a trophic cascade and how exactly do wolves change rivers? George Monbiot explains. Living among a pack of wolves at the edge of Idaho’s Sawtooth Wilderness, Jim and Jamie Dutcher spent years in a tented camp intimately observing the social hierarchy and behavior of the famous Sawtooth Pack. Most commonly known as evil villains from childhood fairytales, wolves have long been the subject of strange myths, causing many humans to fear them. Living with Wolves sets out to debunk cultural misconceptions of these elusive creatures. What happens to nature after a nuclear accident? The historic nuclear accident at Chernobyl is now over 30 years old. Filmmakers and scientists set out to document the lives of the packs of wolves and other wildlife thriving in the “dead zone” that still surrounds the remains of the reactor. Farmers are well aware that Wisconsin’s wolf population has made an incredible comeback. One Bayfield couple has turned to Maremma dogs for protection. They’ve been used in Italy to guard sheep from wolves for over 2000 years. They look very much like sheep and are raised with the flock. Early exposure along with the Maremma’s instinct for protection results in a great tool to keep predators at bay. Ranchers who struggle to coexist with large predators are finding new hope in old dog breeds. While these Old World livestock guardian dog breeds have successfully defended livestock from predators for thousands of years in Europe and Asia, they remain relatively unknown in the American West. Explore how they work for one family, and what it means for the maintenance of large predators, like the wolf, on the landscape. Mary Falk and her husband have been raising cows, goats and sheep in Wisconsin wolf country for over 25 years without loss…here’s how they do it ! 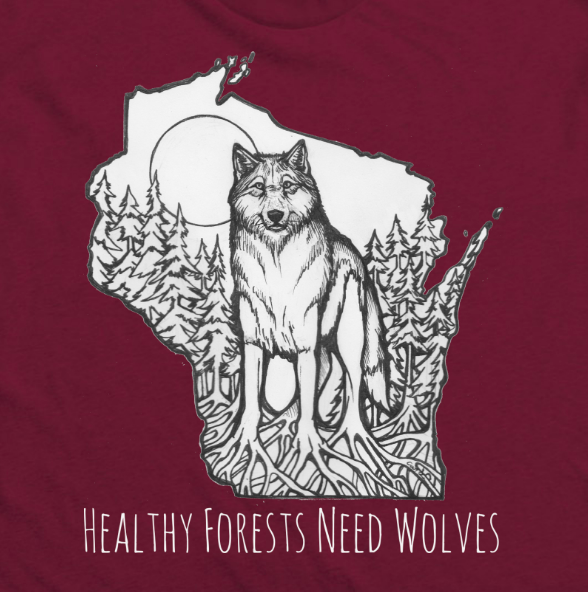 Help us fight to protect Wisconsin wolves by purchasing our brand new t-shirt. Proceeds go directly to support grassroots organizing to keep wolves protected in Wisconsin. Friends of the Wisconsin Wolf & Wildlife formed in response to the wolf hunt and expansion of hunting and trapping in our state parks. Our mission is to advocate for Wisconsin wolves and wildlife by bringing diversity, science and democracy to wildlife policy. Stay up on the latest! Subscribe below to receive email updates on everything wolves and wildlife.